The upfront cost is more than woods such as cedar, redwood and pressure treated lumber, but not as expensive as some tropical hardwood decking. However, since the maintenance costs are minimal and you won’t be buying stain and sealer every couple of years, PVC decks cost less when averaged over 20+ years. 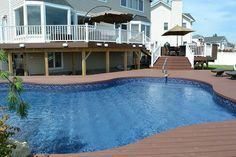 This PVC decks buying guide gives you comprehensive information about PVC plastic decks, their cost, pros & cons of PVC decking and more. Our readers use this guide to compare PVC decks with the other materials we’ve created buying guides for such as PT lumber, tropical hardwood, cedar, redwood and composite decking. PVC is polyvinyl chloride, a very common plastic. Most of the material used in decking is called cellular PVC due to the structure of the plastic which makes it stable and resistant to cracking or warping. The PVC used to make this decking is mostly virgin plastic, meaning it hasn’t been recycled. In that respect, PVC decking isn’t as green as composite which is contains 80%-95% recycled materials depending on the brand. However, PVC is recyclable. The PVC is pigmented for color, heated and extruded into decking planks, rails, posts and accessories. Depending on the specific product, the grain is either pressed or cut into the material. Top lines of plastic PVC decking are called “capped PVC” which means that the PVC core is coated or capped with a high-quality, high-durability PVC material that often contains minerals to create a harder surface. Capped PVC offers premium appearance and wear. 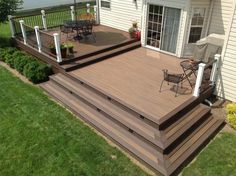 You’ll find PVC decking in square-shouldered styles that are installed like traditional wood planks and grooved styles that install like tongue & groove planks with hidden fasteners. Some grooved PVC decking is snapped together. The most popular width by far is 5 ½”. Plank lengths of 12”, 16’ and 20’ are the most common. The thickness of PVC deck planks ranges from about 5/8” to slightly more than 1”. A PVC deck will cost you more in its first 5-7 years than a pressure treated lumber deck or a cedar deck because the initial cost is significantly higher. Somewhere between year 7 and 10, depending on how much you paid for the PVC deck, it becomes more cost-effective than PT lumber and cedar. This is due to the much higher cost of maintaining wood decks with annual or bi-annual power washing, staining and sealing plus the greater need for deck repair due to warped and cracked wood planks. With that in mind, consider PVC decks vs. wood decks in light of how long you plan to live in your current home. It’s worth pointing out that a PVC deck will be more attractive to many buyers because it will look better than a wood deck of the same age, and smart buyers understand the ongoing costs of PVC are much lower than with wood. Woodgrain PVC decking looks like plastic, not truly like real wood, and it doesn’t smell like wood. If the “genuine wood” experience is important to you, PVC might not satisfy. 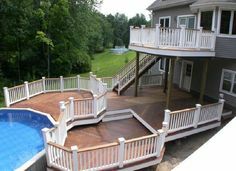 There are a few cons of PVC decks to consider before you make your decision. How Much Does it cost to Build a Deck Using PVC? 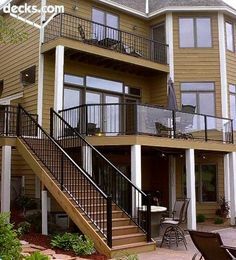 A complete deck usually starts with a pressure treated frame, not one made from PVC. 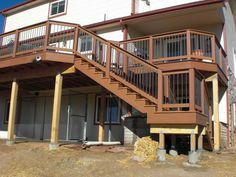 Then, in addition to the PVC deck boards, PVC rails, posts, stairs, fascia pieces and accessories are added to complete your deck design. The estimates you receive from deck builders in your area should be in this price range. Deck repairs cost more per square foot than building a new deck because repairs are more time-consuming and labor-intensive. This is a very low-maintenance product. Here’s what it takes to keep your plastic PVC deck looking great. This PVC deck Q&A covers other important issues. A friend says he has a vinyl deck. Is that the same? PVC is polyvinyl chloride. 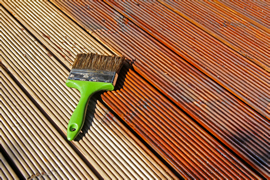 Your friend’s deck is probably PVC, which goes by the names plastic, vinyl and synthetic too. What’s better, composite or PVC? 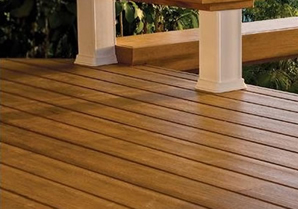 Composite decking is a combination of wood fiber and PVC, for those who aren’t familiar with it. See our Composite Decking Buying Guide for all the details. The materials in composite are mostly recycled from pre- and post-consumer waste. PVC is made from virgin material, for the most part, but it is recyclable. PVC has the advantage of being more resistant to stains and mold penetration than composite. The upfront cost for PVC is 10%-25% higher than for composite, depending on the products compared. Both are resistant to warping, cracking, insects and fading. Composite decking can be stained, at that requires an investment of time and money. PVC doesn’t require staining. Both materials should last 20-30 years with consistent care. Can PVC decking be used around pools or hot tubs? Yes. The material is slip-resistant and won’t be harmed by pool or hot tub chemicals. Will mold or algae grow on a PVC deck? Mold and algae can grow on just about any surface, but they won’t penetrate PVC or stain it, as they can do on wood or composite. Both are easily removed with a mild bleach solution and a brush, followed by hosing off the deck. I’m going to install my own deck. What do I need to cut PVC? A circular saw fitted with a 100-tooth carbide-tipped blade delivers the best results. What joist spacing is optimal? Most PVC decking should be installed on joists spaced 16” apart, though some material can be installed on 24” spacing. If you’re installing PVC in a commercial setting, 12” spacing is recommended. How long will my PVC deck last? The material was introduced in 2009, so we’re not sure how long it will last or look good. Estimates are from 20-30 years. With any deck material, the quality of the installation is a big part of what determines how good the deck will look and perform. Quality installation is very important. 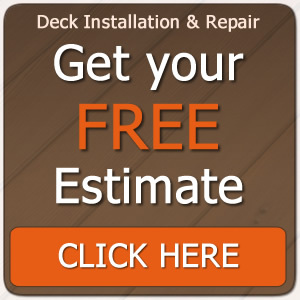 If you’re ready to get deck cost estimates from contractors in your area, we can help you find the right mix of competitive price and an experienced deck builder. This reduces the hassle of contacting a list of contractors in your area and waiting for them to get back to you. When you use our free service, you fill out one simple form with basic information about your project. Then, you receive written estimates from screened and qualified deck installers where you live. Again, there is no cost, and you are not obligated to take any of the estimates.